Steve Reinmuth to express his artistic ideas, found that he could achieve this by using bronze as his medium. He liked the smooth, flawless surfaces, with beautifully polished surfaces, with vivid patina colors, sculptured parts interlocking fitted togather achieving his artistic vision. Steve wanted more than just transmitting his ideas on paper or having someone else finishing them. He has a natural curiosity on how the parts of an object can be put together to form a whole so he started looking for a way of reaching this goal. Taking his projects to others to cast did not leave him with the satisfaction that the work was totally his. He wanted to complete the project from the alpha to the omega. Steve then tried his hand at doing his own castings. Doing this, along with his nature of perfection gave him the fulfillment he needed. Over the last decade and a half, he developed his own modius of operandi in casting the parts of his sculptures. Many times he ran into road blocks; not being able to achieve the exact finishing or outcome he wanted along the way, Steve often designed, engineered, and fabricated his own tools and implements to do his work. His perfectionist nature and tenacity to reach his objective guided his path reaching his finished project. In reaching his objective, he built his own foundry. Doing this made him an overnight success; of course this only took fifteen years to achieve, often working eighty to one hundred hours per week every week. Starting to work in his backyard, he redesigned his garage into a studio and refurbished a storage shed into a shop for working on his maquettes and molds. To have a place for casting his artwork, a friend who lives out of town encouragingly invited him to build a lean-to foundry on his property. Steve had to design and build his own wax melting furnace. This in conjunction with a used bronze melting furnace, allowed Steve to do his castings. He would then bring his castings back to his house for welding together, applying patina, and polishing to finishing his project. Steve took some of his sculptures to the Loveland Sculpture Show. A number of artists from other parts of the country wanted to know where he had his foundry work done. They were impressed with the smooth, highly polished surfaces and patina hues. Finding that he did his own work, they wanted to know if he could do work for them. Thus, Reinmuth Bronze Studio was born. Finding a building in the industrial section of Eugene, Steve and ZoAnn built a new ‘Reinmuth Bronze Studio’. Again, not being able to locate some of the key elements needed for his production process, he again designed, engineered and fabricated what he needed. his goal is not only producing sculptures, but the finished product has to be completed with “uncompromising quality”. 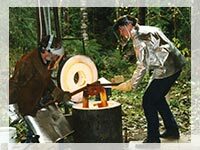 The foundry, which provides all traditional foundry services including in-house base making in wood or stone, enlarging, installation, repair and refurbishing services, has expanded from just bronze to include aluminum. 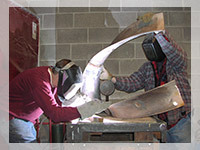 Projects can also be fabricated in steel, stainless steel and aluminum. Liking a challenge, Steve has created fountain sculptures with movable parts to kinetic and other types of functional art. Often these projects require an innovative and unusual engineering problem to be solved. Whether the artwork is a tiny figurine or monumental piece, a complex sculpture or a flat piece, such as a plaque, all projects are completed with ‘uncompromising quality’. Copyright 2006 Reinmuth Bronze Studio, Inc.